Marc Jacobs has managed to pretty much nail the lust-worthy fragrance market, with each new launch there’s just something about the cute bottles and girly but not childish fragrances that lure me in every time. So far though, none of them have *quite* managed to beat the amazing-ness (yes, that is a word…) of Daisy Eau So Fresh. I adore that fragrance and it was the first that was absolute love at first sniff. Still now it makes me want to take a lung full every time I smell it. 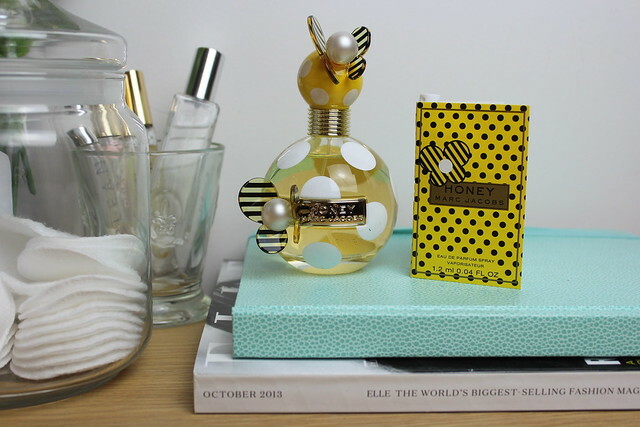 But this post isn’t about Daisy, it’s about Honey – the latest addition to the Marc Jacobs fragrance family – joining Lola, Daisy and Dot. Firstly, Honey continues the tradition of adorable bottles. With the little round bottle housing the fragrance, covered in white dots and little yellow and black striped butterflies. It’s definitely dressing table worthy! But what does it smell like? Well, it’s quite fruity and sweet – with top notes of pear, fruity punch and mandarin. Then heart notes of apricot, honeysuckle, peach nectar and orange blossom and base notes of honey (obviously! ), smooth woods and golden vanilla. So on first spritz you get the zesty fruity scent but it drys down to something softer – with the vanilla and honey combination lingering on the skin. This bottle of fragrance came from Debenhams and I have to mention the nice little touch of the adding in the sample sized fragrance – this is basically so you can ‘try before you open’ – so even if you have bought the fragrance you can try out the small sample first, decide if you like the bigger bottle before you ‘commit’ buy opening it properly. I think it’s a really nice touch – taking the risk factor out of buying fragrance online. Very important if you’re perhaps starting to think about something like Christmas shopping…and perhaps aren’t 100% if the person you’re buying for will like the gift. You could purchase something like this and include a little hand-written note explaining that they can try it and decide if they like it! Far more exciting than opening a gift voucher or something! I’ve sniffed this at House of Fraser so many times! Definitely on my list of ‘things to buy when I get paid’! !